Voted the BEST Hair Salon in Indianapolis, G Michael Salon Knows Blondes. 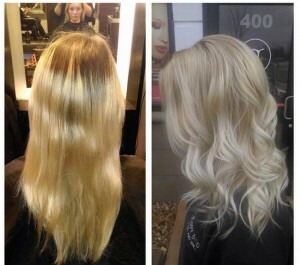 We love when we can transition a guest with a lot of golden tones to a cool beige Blonde Bombshell. This is the second time that Kaleigh has been to G Michael Salon and she is LOVING her hair color! If you desire that perfect blonde hair color, call G Michael Salon in Indianapolis, Indiana TODAY and find out….What your locks have been craving!